This entry was posted in Uncategorized and tagged Bible, Christianity, Death, Disciples, Dogs, Dominican Order, Easter, Episcopalian, Gospel, Gospel of Matthew, Henri Nouwen, Jesus, Miracles, Moral Theology, Religion, Salvation, Scripture, Spirituality, Theology. Bookmark the permalink. For our companions who teach us how to live with unabandoned joy and thankfulness for all they receive, thanks be to God. May God grant us the grace to cast aside our fears and leap with delight in the beauty and love that surround us. So that would be an interesting view of Heaven–playing hard for about two hours a day, being scratched behind the ears for another two hours, and restfull sleep for the balance of the day. From first hand observation, I have no doubt that Georgia considers herself in heaven. I’m pretty sure she does. She’s looking forward to seeing you again. How easy it can be for me to lose sight of the joy I should feel every moment of every day as I live with the knowledge of God’s wondrous love. And how amazing it is that dogs just live that life without having to think about it. I think I’m a bit jealous of Georgia…give her a scratch and a tussle from me! Lots and lots of people are jealous of Georgia, including me. Most, moster and mostest excellent! That is high praise from my Franciscan friend. Happy Easter to you as well! I love this post, and am forwarding it onto my favourite dog lover/RCIA coordinator. I’m so glad you liked it. Yes, I’m pretty much crazy about my beasts. Thanks for the blessing. 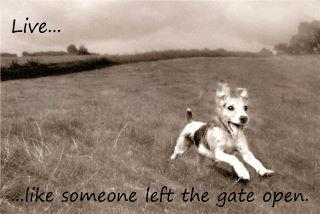 “Live like someone left the gate open”….wow…l can run with that! My brother have a great weekend. I hope we can all run with that. I was very busy this week so I didn’t have a chance to read this meditation until today, our beagle’s 15th birthday. She is deaf and partially blind but she still has that wonderful joy you describe. In her own way, our Sunny preaches the gospel to me everyday. Thanks for reminding me. James, our dogs are a constant reminder of the simple joys of life. I’m pretty sure that if you left the gate open Georgia would be sitting on the front porch when you got home! And don’t forget about Clint (you wouldn’t) because even though his joy is not as exhuberant as Georgia’s it is there as well. What a difference we could make in the life of others if we greeted them the way our dogs do. Well, maybe not actually jumping on them! But showing how happy we are to meet them. Our beasts serve as constant reminders that we were made for joy, and that all the other stuff is mostly just unintended consequences. I think your observation about how we greet others is well taken, and worth trying to incorpotate into our commmon life. You are most welcome. I hope all’s well with you. Loved this!!! Thank you for stopping by today, Brother James. God bless you big and often!! I’m glad the piece spoke to you, Arlene. 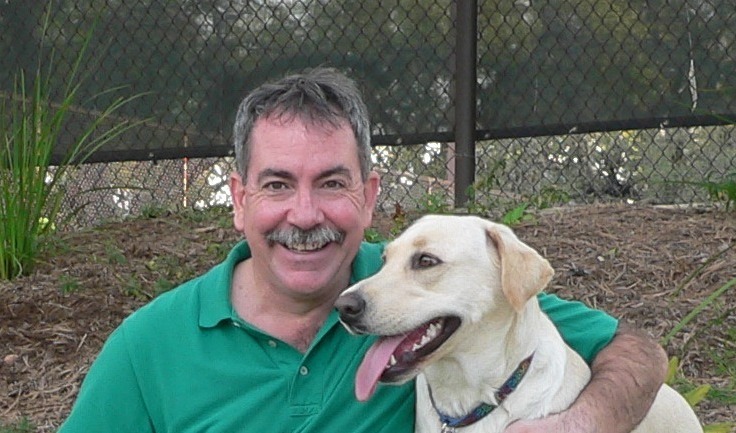 It’s been my most popular post, which has given my dog Georgia a tremendous ego (wry grin).